Rating: 18+. Apparently I can’t write stuff for a general audience even if I try. Not that I was particularly trying to. The first episode (chapter) will be available for free. After that, reading is subscription-based, but the subscription is barely $3. And you can get the audio version as well. I’ll be reading it (I’m not that bad). When the novel’s all said and done, it’ll (probably) be gathered into a volume and sold as paperback, audio and full electronic version, in some sort of pricing combos. Yeah… Not feeling up to writing anything more fascinating in this blog post right now. So laterz. 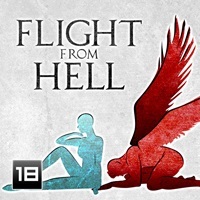 4 Responses to ""Flight from Hell" on August 4th"
Sunt cu ochiu’ pe aici. Ca pe situl ala nu ma descurc.